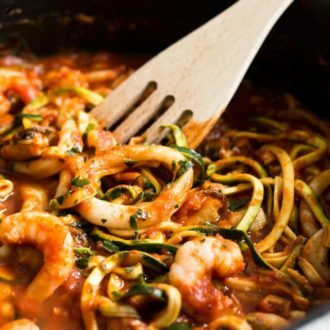 Seafood Zucchini Marinara makes a great quick and easy weeknight dinner! 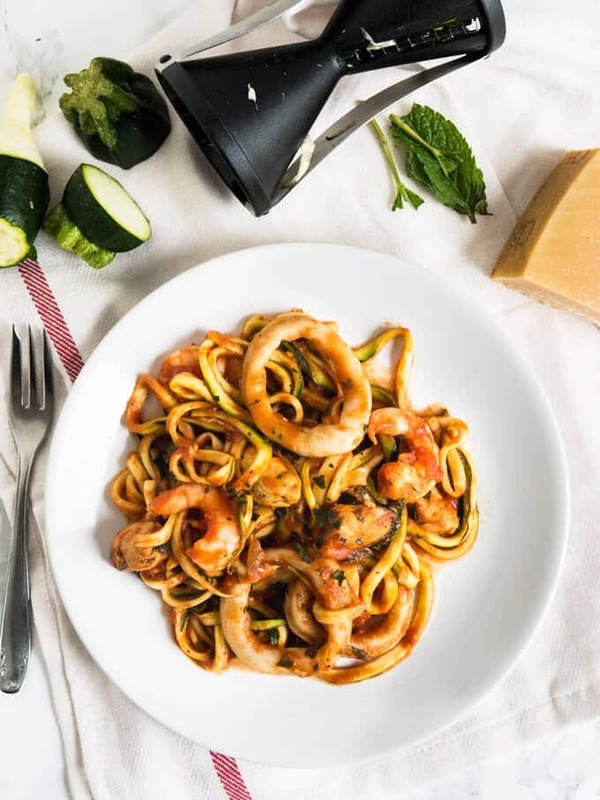 Replacing normal pasta with zucchini noodles (zoodles) is a great way to eat healthier. To balance out my Salted Caramel Pretzel Brownies with Nutella from my last post I wanted to share something healthier today. I love pasta but it’s almost summer and my goal is to eat more veggies and fruits. One of my favorite ways to do that is by swapping out the pasta for zucchini noodles! I use a little handheld spiralizer to make my zoodles and it gets the job done really quick. You don’t have to replace all of the pasta. If I would serve my husband only zoodles he wouldn’t be happy. So I trick him by making only half the amount spaghetti I would normally cook and add zucchini noodles! For my Seafood Zucchini Marinara, I used frozen seafood, it’s already pre-cooked and you only have to defrost it. I cooked the seafood mix, mine had mussels, shrimp, and calamari in it, for 1 minute in a hot pan before I started the tomato sauce in the same pan and added it with the zoodles to the sauce after it had cooked for 15 minutes. By cooking the seafood mix only for 1 minute and then 2 minutes in the sauce you prevent it being overcooked. 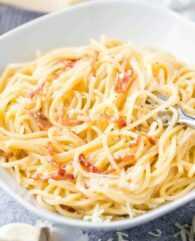 The sauce will infuse the zoodles and the seafood with all those good flavors. During cooking your tomato sauce will get thicker, don’t add additional water because the zucchini zoodles will release water while they sit in the hot sauce. 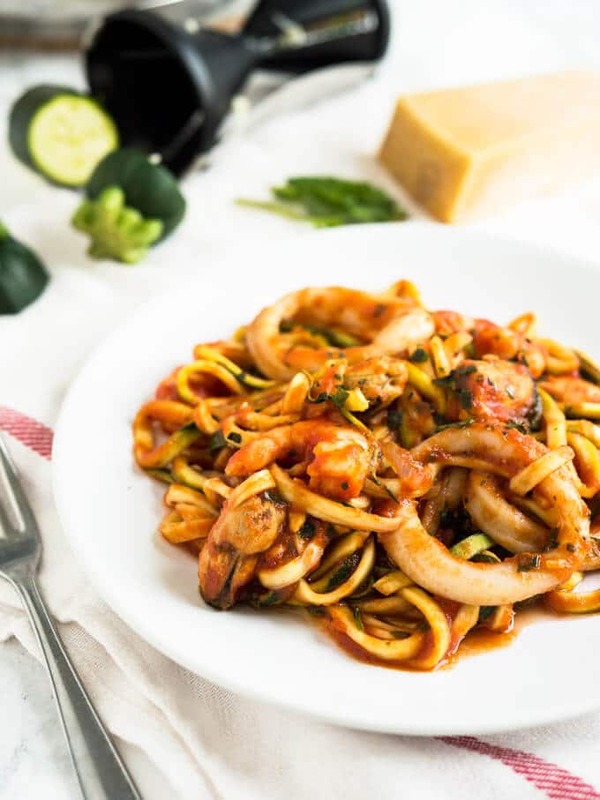 If you want to add a few real noodles just add the cooked pasta together with the spiralized zucchini and the seafood to the sauce. 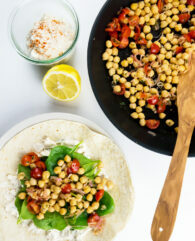 This dish makes a great weeknight dinner! 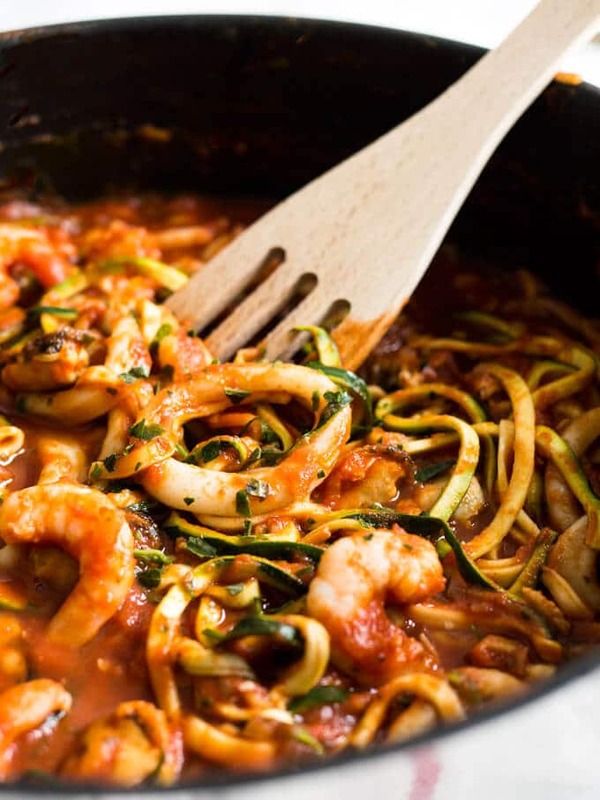 Seafood Zucchini Marinara makes a great quick and easy weeknight dinner! Replacing normal pasta with zoodles is a great way to eat healthier. Heat 1 tbsp olive oil in a large saute pan over high heat. Add the seafood and cook for 1 1/2 minutes. Transfer to a bowl and set aside. In the same pan, heat 1 tbsp olive oil over medium-high heat. Add diced onions and saute for 2-3 minutes, stirring occasionally, until the onions are soft and translucent. Add minced garlic and saute for more 1 minute. Add the tomato passata, salt, pepper, and sugar, stir to combine. Cook until the sauce reaches a simmer. Then reduce the heat to medium-low and continue to let the sauce simmer for about 15 minutes. 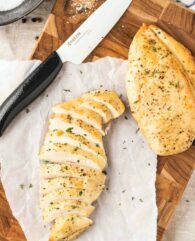 Taste, and adjust seasoning if needed. Add in the spiralized zucchini and the seafood, toss until everything is evenly coated with sauce. Continue to cook for 2-3 minutes until the zucchini noodles are slightly softened.